How can IT regain the confidence of the Business to engage early and enthusiastically on the Big Data journey? I love EMC World (though I can't say the same about Las Vega$). I get an opportunity to talk to customers who are at the dirty and grimy frontline of trying to derive value from all of this Big Data hoopla. They teach me tons! "I can't get the Business to engage in an envisioning type of engagement. We have lost their trust. So we are forced to start our Big Data journey from the technology." This is a huge problem. It is hard to drive meaningful business impact and a compelling Return on Investment (ROI) by starting with the technology and hoping that someone in the business finds something of value in the technology. This "Field of Dreams" ("If you build it, they will come") approach is not a good way to run a business. So what can IT do to build trust with the Business? 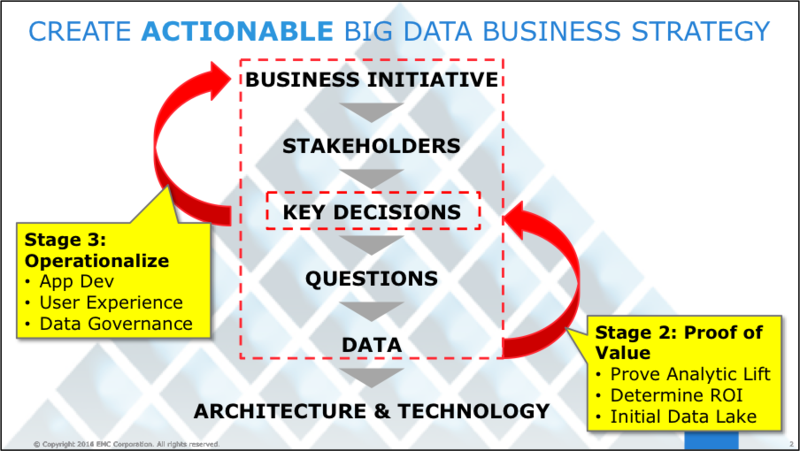 How can IT regain the confidence of the Business to engage early and enthusiastically on the Big Data journey? Let's review some simple but actionable recommendations. 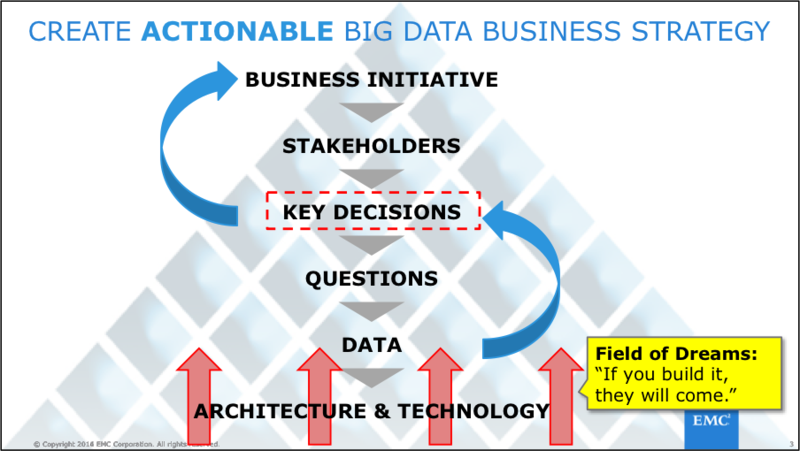 Once you have agreement with the Business upon which business initiative or business process to target, then you are prepared to break down that initiative or process into its relevant business requirements: key stakeholders, desired business outcomes (business use cases with supporting decisions), illustrative analytics, brainstormed and prioritized data sources, and prioritized use cases (see Figure 1). It is very tempting to focus your business recruiting efforts with the high visibility business functions such as Marketing, Finance, or Sales. But those groups have historically been saturated with over-promised and under-delivered Business Intelligence and data warehousing promises. So maybe it's better to recruit someone who historically might be underappreciated, like Logistics or Inventory Management or Facilities Management or Customer Service. One thing that I hope we learned from the Business Intelligence and data warehouse days is that it is insufficient to just provide the technology to the users and "hope" that they find something of value. "Hope" is only a strategy if you're in the cosmetics business and doesn't it play so well in the data and analytics space. 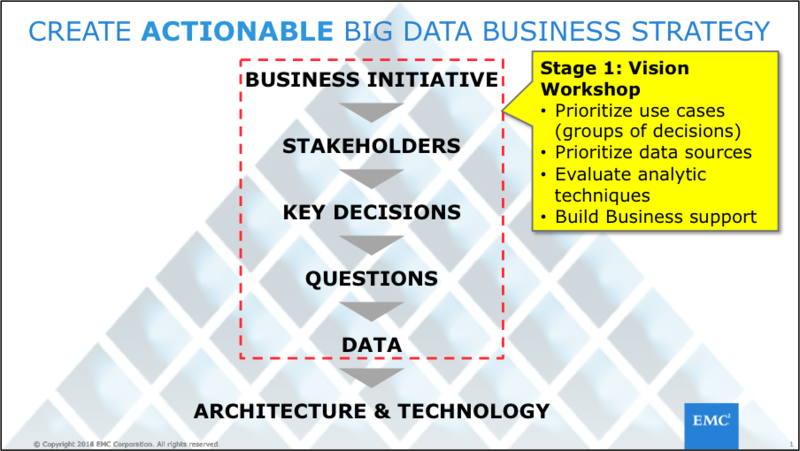 Consequently, IT must be prepared to take the business ideas and prioritized use cases coming out of the Big Data Vision Workshop process all the way through the Proof of Value and Operationalization stages (see Figure 2). The Proof of Value stage is designed to prove to the Business that the data science work can produce the necessary analytic lift, or business process improvement, that drives the compelling financial Return on Investment (ROI). Yep, all the hard and ugly IT work necessary to ensure that the Business realizes the financial payback and projected ROI on an ongoing basis; that the results of your big data engagement were not just a one time gig. Now that you've done it once, let's do it again. 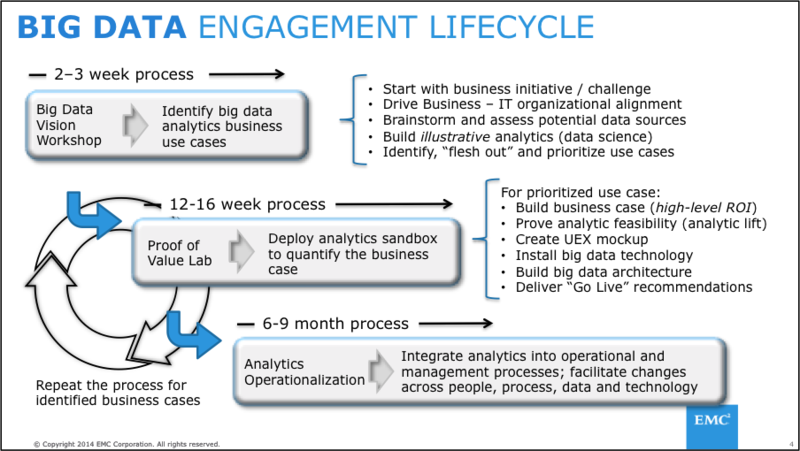 Be prepared to "wash rinse repeat" time and time again; be prepared to prove yourself and the business value of IT to the Business time and time again by embracing the Big Data Engagement Lifecycle (see Figure 3). Any one can get lucky once, but in order to continue to build trust and confidence with the Business, we need a business-centric process that allows us to leverage data and analytics to deliver compelling business value time and time again. Not only will IT build trust with the Business in this manner, but IT will also become indispensable to the very success of the Business. Yeah, that's a nice place to be. IT needs to resist the urge to take the "Field of Dreams" approach and lead the journey with technology. Do not believe for a moment that if you build the data lake and populate it with some data, that some how, some way, some one will find something of value in that data lake (see Figure 4). "What are the lessons for traditional businesses looking to Big Data to transform their businesses? ...as [American Express] illustrates, sponsorship from the top remains essential. Long-term journeys require staying power and commitment." It is not sufficient to just have the Business in the boat with IT; the Business must be standing at the front of the boat hand-in-hand with IT to get the most business value out of your Big Data journey. That means addressing the trust issue right up front. Hopefully this blog has given you some ideas how to enlist the Business to join you on this most excellent Big Data adventure!